If you asked earlier generations what their biggest fear was – they might have answered, “dying too young.” Asking that question today would probably get you the exact opposite answer: “I’m worried about outliving my money.” It’s a fear that is shared by many – even wealthy individuals. According to the 2015 AICPA CPA Personal Financial Planning Trends Survey, more than 41% of CPA’s indicated that running out of money was clients’ #1 concern. While a healthy amount of fear of running out of money may keep your spending habits in-check, it’s important to know WHY you have that fear. Ask yourself three questions to help you assess the “why” — and whether or not your concern may be valid. 1. Am I afraid future (unknown) health concerns will deplete my assets? Many people know someone (parent, friend, sibling…) that had a serious health issue that either caused their assets to be significantly reduced (less left for future generations) or completely depleted so they were forced to apply for Medicaid. Watching someone go through this process can be scary. Luckily, there are options for you to consider now while you’re relatively healthy rather than when/if you’re faced with such a situation. Consider long-term care insurance. While it is expensive, it can provide you with vital financial help when you’re in need of home care, nursing home care or assisted living care. Speak with an attorney about the pros and cons of trusts. A lawyer will explain in which instances you may need to give up control of most, if not all, of your assets depending on your long-term objectives. If your ultimate goal is to leave a financial legacy to your heirs, then you may want to purchase life insurance. This can give you the freedom to use your current assets to provide you with the care you may need in the future, while at the same time providing for future generations. 2. Am I worried market fluctuations will hurt my net worth? During 2008 many people feared they would not have enough to retire or to continue their retirement. The Great Recession served as a reminder not to rely solely on the stock market for income and to consider alternatives. If you’re offered a pension option (lifetime income) from your employer, consider all scenarios and potential outcomes with a financial planner. If you don’t have a pension option, you may want to discuss other potential sources for monthly income. It’s essential that you have dependable sources of income to cover your basic needs – food, shelter and clothing. Social Security is another important income source. It’s critical to include social security estimates when determining what your retirement needs are. Remember, estimates are based on your continuing to work until at least 62 – if you retire before that age it will significantly impact your estimated benefit. The longer you can afford to defer benefits (and retirement), the higher the amount you will receive. There are many options for drawing on social security that people aren’t aware of; make sure to speak with someone knowledgeable on the subject prior to making a decision. Review your investments at least annually to make sure they are still meeting your objectives. Are your investments too aggressive, which might leave you vulnerable to larger losses in a downturn, or too conservative, which might limit your potential gains in an up-market? It’s important that you’re invested to meet your long-term goals and not making quick decisions based on short-term market fluctuations. Making changes under stressful circumstances often leads to negative consequences. 3. Am I worried I spend too much? It’s easy to go through life without a concrete spending and savings plan in mind. While it’s not fun (or healthy) to worry about every little penny, you should have a general idea of your income, how you’re spending it and how much you’re saving. Complete a cash flow form to help you determine your net income and spending patterns. Do you make more than you spend? Are you setting any savings aside – for short-term, mid-term and long-term needs? Now complete a second form and title it “Retirement.” Allow yourself to sit back and imagine what your retirement will look like. Are you home gardening, out shopping with friends, traveling within the US visiting family, or traveling overseas to see the world? Each of these scenarios will affect your retirement spending. Attempt to quantify how much what you want to do will cost; this will give you a good idea how much you need to save in order to meet that goal. Have a financial plan in place. This will allow you to compare the financial impact of each retirement scenario you envision. A financial plan provides you an outline of goals to work for, which hopefully will keep you on track during times of panic. 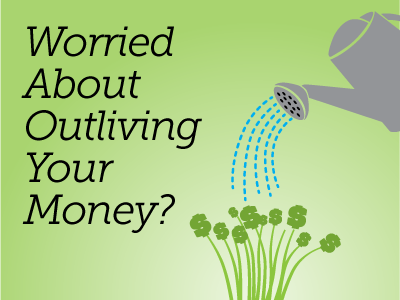 Still worried about outliving your money? While outliving your assets is a common fear now, it is still surprising (and usually unnecessary) when high-net-worth individuals are deeply worried. The first step in overcoming any fear is facing it – so ask yourself the three questions. Once you’ve determined the source of your fear, follow the outlined steps. Taking action by taking control of your finances is the second step. A financial plan helps you identify the path you’re currently on and whether you’re on track to meet your goals and minimize your risks. Unmask what’s behind the fear of outliving your money to allow you to sit back and enjoy life today. Christina Ubl, CFP® CDFA™ of Clute Wealth Management in South Burlington, VT and Plattsburgh, NY, an independent firm and registered investment advisor that provides strategic financial and investment planning for individuals and small businesses in the Lake Champlain Valley region. The opinions voiced in this material are for general information only and not intended to provide specific advice or recommendations. For a list of states in which we are registered to do business, please visit www.clutewealthmanagement.com. Securities offered through LPL Financial. Member FINRA/SIPC. Clute Wealth Management and LPL are separate entities.